For those of you who’ve seen the previews and have questions about Ryan Reynolds playing a badass covert operative, don’t worry, he’s not. Matt Weston (Reynolds) is the low man on the CIA totem pole. His duties consist exclusively of babysitting an agency safe house in Cape Town, South Africa, a safe house that hasn’t been used, by anyone, in the 12 months Weston has been there. He spends most of his day checking in with his superiors at HQ and bouncing a tennis ball off the bare walls. Weston yearns for action, for an opportunity to prove himself, and boy howdy does he ever get his chance. 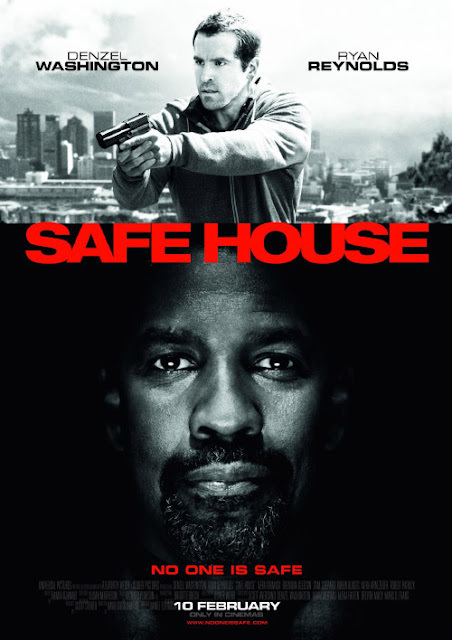 When ex-CIA spook, and notorious turncoat, Tobin Frost (Denzel Washington)—Tobin Frost is a solid spy name, I must say—pops up and turns himself in, he is interrogated at Weston’s safe house. That’s the plan anyway. Turns out a gang of anonymous thugs has a different idea, and before anyone learns anything from Frost all hell breaks loose. The rest of the movie is a twisted series of Weston and Frost running, fighting, eluding their pursuers, and Weston lying to his girlfriend (Nora Arnezeder) and coping with Frost’s constant escape attempts. This is a CIA movie, and if CIA movies have taught us one thing it is that there is always, always a leak in the CIA. So there’s that to deal with, which only throws Weston and Frost from one hot-button situation to another to another. “Safe House”, despite the well-trod international espionage trajectory, this is a movie worth checking out. If nothing else, you get to watch Denzel be a straight-up badass, both in fight scenes as well as moments of quiet menace.